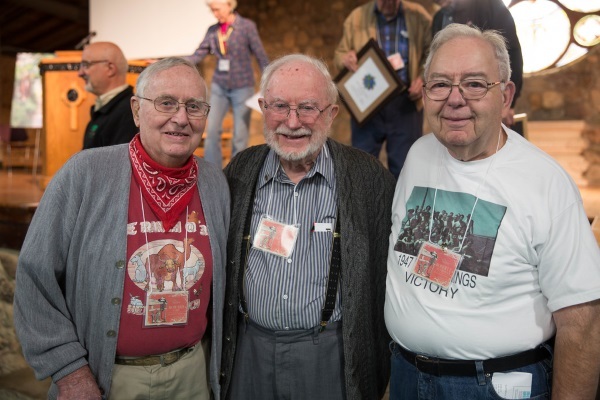 Rock Springs Victory shipmates Howard Lord, Richard Hoblin, and Bob Heimberger reunite at the Beyond Hunger Northern Indiana event, September 2014.
is any one still alive from that ‘Easter Sunday service……….. How well I remember that morning!. .The sea was as smooth as glass. The humidity was not disturbed by a single whisper of breeze. Clouds of flies followed the Rock Springs even though all cattle had been left behind in Djibouti, And a ship load of left behind manure/ spent bedding had been pitched overboard, to be dispersed into the ocean via retreating tide. A two day job by a horde of barefoot locals . All unloading in mid bay where years of Italian occupation and war left no shore side dock of ocean going ships. Great to hear from you, Robert! Yes, as far as I know, all three of the men listed are still alive. I’ll send you an email to follow up.